and then the article was picked up by the Philly Enquirer. 2). From this, I got a call from Sandra Firpo, Produced for KGO Morning News, an ABC Radio, San Francisco, who read with interest David’s article and asked if I could talk about the “phenomenon” of celebrity triple deaths with Ed and Jen. I did a live interview around 10:45 AM on Jume 30, 2009. A link to the interview is at (http://www.kgoradio.com/Article.asp?id=1392817&nId=14&spid=20399). Three-ness: Do Things Manifest in Threes? 3). And finally, on July 8, 2009 I had a very fun interview with Maurice Drummond and Rich Gould for 590 The Fan KFNS (http://www.kfns.com/martinradio.aspx), a FOX affiliate. Look at the Rewind Section for the audio. They we’re hillarious. At the end they were talking about the Manchurian Candidate and being brainwashed by things in threes. I came off as an esoteric man obsessed with life in threes, which is pretty darn close. 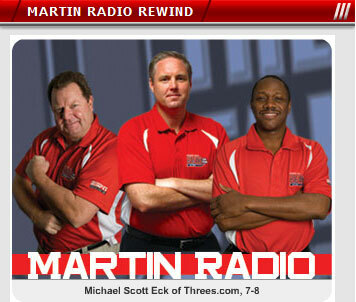 Martin Radio is where sports and entertainment collide. The show is hosted by Veteran TV Sportscasters Martin Kilcoyne (FOX 2) Maurice Drummond (Fox 2) and Rich Gould (KPLR 11) and features the perfect blend of sports talk, entertainment and real life. Men wake up each morning to Martin and Mo or Rich’s dynamic sense of humor and unique takes on the world of sports. Plus, visits from the biggest local and national guests. The show also features “Celebrity Phone ins”, “He’s a Nothin” “Ask Tony”, “Martinsville” as well as “You Blew It”. Previous post: For Celebs, Is Death a True ‘Triple’ Threat? Next post: Three-ness: Do Things Manifest in Threes?